Prepare fire for indirect-heat cooking in a covered grill. Rub ribs with vegetable oil and season both sides with salt and pepper. Place ribs, not overlapping, over indirect heat on grill. Close grill hood and cook ribs NOT directly over coals for 1½ hours, until ribs are very tender. In final minutes of grilling, baste ribs with barbecue sauce. 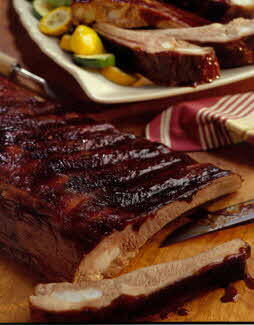 Cut and serve ribs with remaining sauce on the side. Very basic rib recipe. Use your favorite sauce. Tip for incredibly tender ribs: After cooking, remove ribs from grill, wrap securely in heavy aluminum foil. Place foil-wrapped ribs in brown paper bags, close bags and let ribs rest for up to 1 hour. Finish getting the rest of your meal together and have some extra sauce on the table.